This is something that we have been working on at MJM Magic for quite some time, and we're excited to finally roll it out for you! With the magic industry moving further away from discounting products, we wanted a way to still reward our customers for purchasing items at MJM Magic. This led us to roll-out our new MJM Rewards program! What are MJM Magic Rewards Points? Quite simply, they are MONEY! Certain items in our store earn you Rewards Points. You can redeem these points as REAL MONEY on future orders. 1 point = $1.00! So if you purchase an item that has 3 Reward Points, you just earned yourself $3.00 to use on your next order! How can I see how many reward points I have earned? That will automatically apply the value towards your order! Let me get this straight.....I earn money for spending money? ABSOLUTELY! If an item you're purchasing has Reward Points attached to it, then you will automatically earn those points when you purchase it with us! Reward Points = Money in your pocket! How can I tell if an item has any rewards points? It's easy. If you go to the product's description page, we will display the number of Reward Points underneath the price. Also, when you add items into your shopping cart, we will let you know how many points that shopping cart is going to earn you. Is there a minimum amount of points I have to earn before I can spend any? No! Unlike other stores, we don't require you to accumulate any minimums before spending your points! As soon as you earn one reward point, you can spend it on your next order. No minimums required! Can I spend ALL of my reward points on a single order? Yes, up to a point. We have a maximum of only allowing 100 POINTS to be used on a single order. So you can get up to $100 off a single order by applying up to 100 points. Any additional points you may have will be saved and used on a future order. 99% of our customers will never have more than 100 unused points, so this rule will probably not pertain to you. But just in case you like to hoard up your points, just remember: you can only use 100 points at a time. Am I able to apply the Reward Points on the same order that I am earning them from? No. In other words, if you have zero points right now, but you are buying something that will give you 10 points, you cannot apply those 10 points to the same order that you are placing. All reward points are moved into your account after we process the order, and they will be available to apply on your NEXT order with us. Remember, these are LOYALTY rewards, which means we are rewarding you for being loyal and returning to shop with us by giving you money off your next purchase. Yes, they do. We have set a generous timeframe of ONE YEAR that you can use your points. Anyone who has earned points but has failed to use them after 365 days will lose those points. This allows for long months of inactivity for a customer, since some people only make a purchase every few months. However, we consider a customer who has stopped shopping for more than one year to be "inactive" and therefore, any earned points will be deleted. I ordered stuff, but I didn't get the amount of Reward Points that it said I should when the items were in my shopping cart. Why are my points lower? You only earn reward points on the FINAL TOTAL that your order contains. So if you have, let's say, items in your order which will earn you 26 reward points, but then you use gift certificates or prior reward points to LOWER your total. What will happen is that your "NEW" reward points are adjusted to that new total, and recalculated to give you the right amount of reward points for the new amount of money that you're spending. In a nutshell, it's to avoid the "double dipping" principle, where people can try to earn points with points, and that's not allowed. 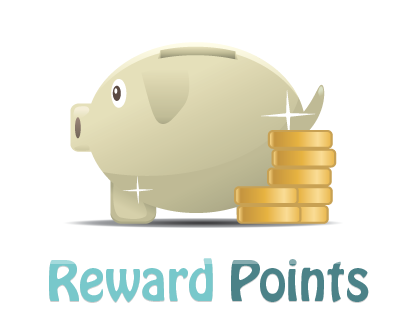 You only earn points on the actual MONEY that you spend, so any credits (like gift certificates or reward points used) are not factored into the new points that you earn. Everything is calculated automatically. Now that MJM Magic is offering reward points, are you still going to offer any other promotions? Of course we are! The beauty about this new system is that we can configure it to offer DOUBLE or TRIPLE reward points during certain promotions! So on certain days, we may say, "Double reward points earned between now and tomorrow", etc. To make sure you stay on top of when we have these special promotions, be sure to follow our social media pages (Facebook, Twitter, Instagram) and subscribe to our newsletter! If you have any other questions, just CONTACT US and let us know!